Senso-ji Temple, more formally Kinryu-zan Senso-ji (金龍山浅草寺), is the oldest temple in Tokyo. Attracting some 30 million people per year, it's one of the most most-visited temples in the country, and an essential part of any visit to Tokyo. Why? Because beyond the history, it's essentially a one-stop-shop for everything traditionally Japanese! Situated near the Sumida River (隅田川・Sumida-gawa) in eastern Tokyo, Senso-ji is dedicated to the Kannon Bodhisattva, the goddess of mercy. According to legend, a statue of the Kannon was found in the river by two fisherman in the year 628, after which the chief of their village converted his house into a temple for the holy relic. This is said to be the origin of Senso-ji Temple, and its kanji, 淺草, can also be read as Asakusa, the name of the neighborhood in which it sits. In 1649, Tokugawa Iemitsu, the third Tokugawa shogun, erected a shrine to the temple's three founders that can still be found to the northeast of the main temple building. Known as Asakusa Shrine, it's home to the Sanja Matsuri (三社祭), one of Tokyo's three most famous festivals, held on the third full weekend in May each year. The temple is also one of Japan's most popular sites to visit for hatsumode (初詣で), people's first temple or shrine visit of the New Year, with nearly 3 million people paying their respects at New Year's alone! Most of Senso-ji was destroyed during the firebombing of Tokyo in March 1945, including the main temple building and five-story pagoda. So while this is technically Tokyo's oldest temple, history buffs may be disappointed that, aside from Asakusa Shrine (which survived the bombing), very little of it is actually very old. However, this doesn't mean there's nothing to see! The trick is knowing what to look for. With a statue of the lightning god Raijin (雷神) standing in its left side and the wind god Fuujin (風神) in its right, the main entrance to Senso-ji Temple is known as the Kaminarimon (雷門), or Thunder Gate. The name is emblazoned in kanji on the massive paper lantern hanging in its midst. The gate itself is just under 12 meters (39 ft) tall and 11.5 meters (38 ft) wide, while the lantern is 3.9 meters (12.8 ft) tall, 3.3 meters (10.8 ft) wide, and weighs about 700 kilograms (1,550 lbs)! The gate was originally built further south, in Komagata, in 941, but was reconstructed and moved to its present location in 1635. It burned down numerous times, and after its upteenth destruction by fire in1865, it was not formally replaced for 95 years, until a concrete reconstruction was finally made in 1960. Now the area's signature landmark, you can expect to see crowds thronging the intersection in front of this gate all day long. The Kaminarimon is the gateway to Nakamise (仲見世), a 250-meter (274-yd) path lined with 89 shops selling gifts and sweets on either side. One of the oldest shopping streets in Japan, it sprang up in the period between 1688 and 1735, when local merchants were given permission to set up shops for pilgrims on the approach to the storied temple. While the original street was destroyed by the Great Kanto Earthquake in 1923, it was rebuilt out of concrete in 1925, and the interiors were again reconstructed after being burned out by the 1945 air raids. Here you can buy your souvenir T-shirts, fans, fake samurai swords and all the Japanese sweets you could hope to find. The popular treat to buy here is ningyo-yaki (人形焼), or "doll cake," a little fried cake typically made in the shape of a doll with red bean inside. Another local favorite is kaminari-okoshi (雷おこし), bars of roasted rice mixed with nuts and sugar. If you're not a fan of the crowds on Nakamise, consider scooting down one of the parallel alleys that run along its east and west sides. These will let you get in and out of the temple grounds a little more quickly, and feature a few hidden shops of their own! Marking the end of Nakamise, the vast Hozomon (宝蔵門), or Treasure House Gate, forms the entrance to the inner temple complex. The original gate was built in 942, with its final pre-war reconstruction dating to 1649, though the existing gate is a concrete reconstruction from 1964. Hung on its northern side you'll see a pair of giant waraji straw sandals, protective amulets remade every 10 years by the people of Murayama City, Yamagata. The Hozomon stands adjacent to the temple's five-story pagoda (五重の塔・goju-no-to), which rises 53 meters (174 ft) from the bottom of its foundation to the tip of its spire. It's believed that two three-story pagodas were first built to the main hall's east and west in 942. Subsequent details are hazy aside from their destruction by an earthquake in 1041, but by the time of the Kan'ei Period (1624-1644), the temple boasted a five-story pagoda to the east and a three-story pagoda to the west. These were subsequently lost to fire, after which only the five-story pagoda was rebuilt in 1648, surviving until the air raids of 1945. The current pagoda dates back to 1973, constructed from steel and concrete on the site of the long-lost western three-story pagoda. Tracing its origin all the way back to that seventh-century village elder's house, Senso-ji's main hall (本堂・hondo), also known as the Kannon-do (観音堂), supposedly still enshrines the Kannon statue found in 628—but since it's never put on display, nobody's really sure whether it actually exists. Prior to its destruction in the Great Tokyo Air Raid, the hall was a designated national treasure dating to Tokugawa Iemitsu's reconstruction work in 1649, though up to that point it had already been destroyed roughly 20 times by fire and lightning strikes, and once by an earthquake in 1041. The current building is a reinforced concrete structure from 1958. On the approach to the main hall you'll see a large incense burner called a jokoro (常香炉). The smoke is believed to cure ailments, so you'll see people wafting it over stiff shoulders and trick knees, while students will waft it onto their heads in the hope of making themselves smarter! You can also get fortunes (おみくじ・omikuji) from the building on your left for ¥100: Pay your fee, then shake the little container full of sticks until one falls out. You then go to the little shelf with the same number to retrieve your fortune. Though the hall itself is closed at night, the main hall, pagoda, and two main gates are illuminated from sundown to 11 p.m., offering some pretty impressive alternate views. Located right across the street from the Kaminarimon, the Asakusa Culture Tourist Information Center (浅草文化観光センター・Asakusa Bunka Kanko Center) is a welcome addition to the Senso-ji area. Designed by Kengo Kuma & Associates and opened in 2012, its eight stories offer venues for various cultural experiences, including a brilliant shamisen experience you can enjoy free of charge—as long as your schedule lines up! The top floor offers both a café and a unique top-down view of Nakamise and Senso-ji Temple, while the first floor has a foreign exchange counter, tourist information in four languages (Japanese, English, Chinese and Korean) and offers walking tours on weekends. Despite the massive temple at its heart, starting around the end of the 17th century, Asakusa developed into the largest pleasure quarter in Tokyo (then called Edo). Asakusa became home to Japan's first dedicated movie theater in 1903, and in the postwar period it grew into a center for comedy and the performing arts, with some two dozen performance halls in the area. And while the temple was destroyed during the war, much of the surrounding area survived—so if you're disappointed by the modern reconstruction of the temple, these streets can offer a much more authentic Japan experience! Denpoin-dori (伝法院通) is a broad, 200-meter (219 yd) street that intersects the northern end of Nakamise. The street's name comes from Denpoin Temple, which stands on its northern side, attached to the greater Senso-ji complex. Less crowded and more spacious than Nakamise, Denpoin-dori presents a more relaxed, "classic Japan" feel that most tourists miss when they follow the throng down the popular central avenue. Here you can find some higher-quality confectionary and craft shops, as well as a more lighthearted attitude reflecting the area's entertainment roots. Street signs featuring Japanese puns are placed every half-dozen paces or so, and if you look up you might also spot the statue of Nezumi Kozo (鼠小僧)—a Robin Hood-like figure and popular kabuki protagonist—atop the Ninomiya Denbo Building, which is located across from the Asakusa Public Hall (浅草公会堂・Asakusa Kokaido). As you progress west, Denpoin-dori becomes Rokku-dori (六区通り), with Hoppy-dori (ホッピー通り) branching off to the north. Traditionally frequented by entertainers, these more modern streets offer reasonably priced shopping, dining, drinking and entertainment, with many eateries particularly known for serving whale—because while the kanji for whale (鯨) is normally read kujira, it an also be read gei, which is the term for "art" or "performance." It was thus said that eating whale would improve your craft! Since 2011, these streets have also been home to Asakusa's miniature version of the Hirosaki Neputa Matsuri (弘前ねぷたまつり), a popular Aomori festival featuring massive illuminated floats. 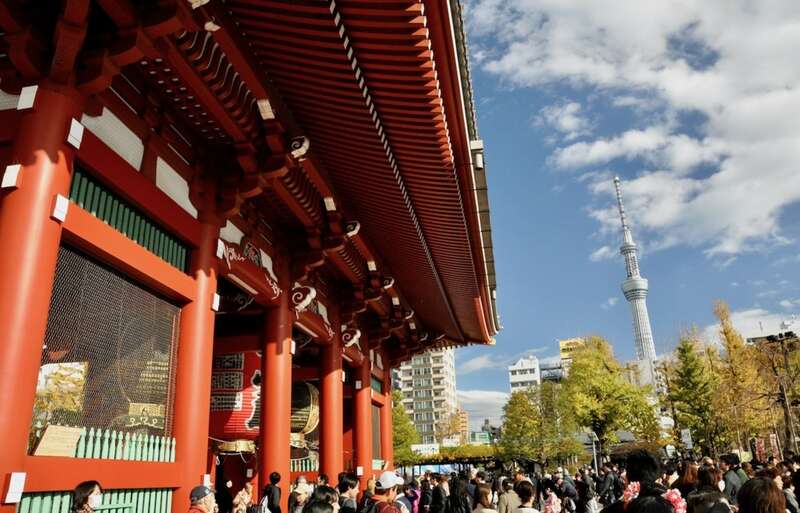 While the schedule isn't fixed, it usually occurs in November or early December, aiming to draw a few of Senso-ji's 30 million tourists into the outer streets. 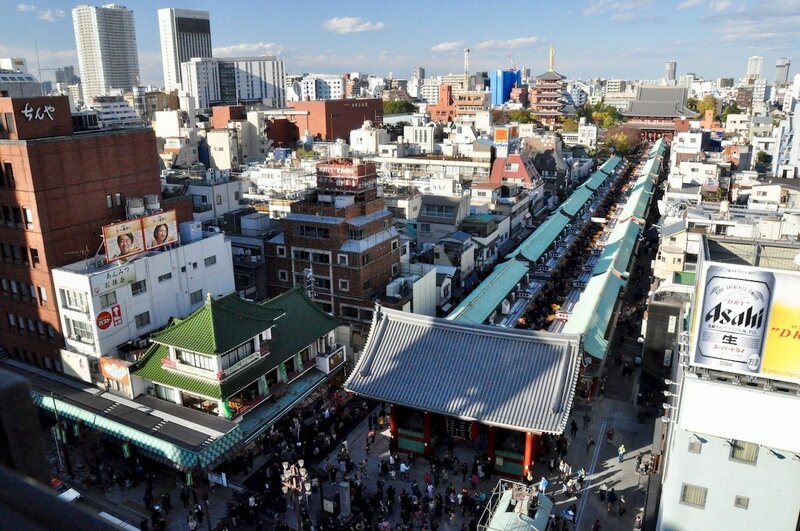 If you keep walking north on Hoppy-dori, you'll soon hit Asakusa Hanayashiki (浅草花やしき), Japan's oldest theme park. It began its life in 1853 as a flower park, but over the years gradually transformed into a theme park with 20-odd attractions, including a haunted house and various rickety rides that can be fun for a bit of old-school feel. If you keep heading west, you can follow Rokku-dori all the way to Kappabashi (合羽橋), known as Tokyo's "kitchen town." Here you'll find a chaotic mix of shops specializing in kitchenware, with a particular focus on world-class Japanese knives! You can see the edge of Super Dry Hall (スーパードライホール), also known as Asahi Beer Hall, from the intersection in front of the Kaminarimon. It stands on the eastern bank of the Sumida River next to the golden Asahi Beer Tower (アサヒビールタワー). Completed in 1989, it was designed by French designer Philippe Starck in the image of a torch with a golden flame, or flamme d'or, at its top. However, given the flame's unfortunate color and shape, it's more often referred to as "the golden turd" (金のうんこ・kin no unko), while the building itself is colloquially known as the Turd Building (うんこビル・Unko Biru). Asahi Beer Tower, meanwhile, vaguely resembles a golden mug of beer with white foam on the roof. While there's no particular reason to go to Super Dry Hall (there are restaurants on the first three floors if you really want), most people will meander to the river to snap a requisite selfie. A fun way to cap off a Senso-ji visit is with a river boat tour down to Hama-rikyu, Hinode Pier, Odaiba Seaside Park or Toyosu, with times ranging from 35 to 70 minutes depending on your destination and boat type. If you go to Hama-rikyu, admission to Hama-rikyu Gardens is included in the cost of your ticket. The ticket building and ferry dock are located just down the street from the Kaminarimon, facing Super Dry Hall at the edge of Azuma Bridge (吾妻橋・Azuma-bashi). It's a fun little tour on the futuristic Himiko and Hotaluna boats, with the roof of the Hotaluna opening up for an even clearer view a few minutes down the line. While the tour admittedly isn't all that spectacular most of the year, there are a few times when it's a real treat: During cherry blossom season in spring, some 700 cherry trees bloom on the banks on either side. The river is also packed with boats for the Sumida River Fireworks on the last Saturday in July, while the Sumida River Toro Nagashi Festival, held in mid-August, sees some 2,500 lanterns floated down the river at night (if you like, you can buy and float your own lantern at Sumida Park just across the river). Then again, if you'd prefer a walk to a river cruise, Tokyo Skytree (東京スカイツリー) is just 15 minutes away on foot. At a height of 634 meters (2,080 ft), it's the tallest tower in the world, and the second-tallest structure after Dubai's Burj Khalifa (829.8 meters/2,722 ft). So you can get your ancient history at the temple and shrine, your more recent history in the backstreets, your souvenirs in Nakamise and your culture in the tourist information center—then cap it all off with a river cruise or a trip to Japan's tallest tower. In short, if you want your full Tokyo experience in one spot, Senso-ji is the place to go!